A night of racing sponsored by Don William’s Excavating provided for some of the most spectacular feature finishes of the year with both Kevin Reeve and Rich Ruff earning their first ever Oakshade feature wins with some last lap heroics. Casey Noonan was the pole sitter of the UMP Late Model Feature and proceeded to lead the majority of the race. Tyler Boggs worked his way up to second by lap seven and began to slowly chip away at the substantial lead Noonan had opened up. A spin by Dan Wallace brought out the caution flag with five laps remaining and totally changed the complexion of the race. Boggs closed up to Noonan’s rear bumper for the restart with serious contender Dona Marcoullier lurking in third. Kevin Reeve took the restart in fourth behind the heavy-hitters in front of him, but as soon as the green flag dropped, he went to work in the outside groove. Coming out of virtually nowhere, Reeve got by Marcoullier and Boggs and then set up Noonan to pass him on the outside as they took the white flag. The crowd rose to their feet as Noonan tried to battle back, but Reeve hung on to pick up his first Oakshade Raceway UMP Late Model Feature win in a very exciting finish. Dona Marcoullier snuck by Boggs to finish third and Curtis Diesenroth ended up fifth. That finish has set up what is sure to be an exciting Oakshade Raceway UMP Late Model Season Championship Night with Boggs taking over the point lead by just two over Casey Noonan. Rusty Schlenk fell to third in the points, but is only 30 behind Boggs. Ronnie Perrine Jr. who is fourth in points also has an outside shot at the title as he sits 72 points out of the lead. Mike Jessen started on the pole of the UMP Sportsman Feature and mirrored what Casey Noonan had done in the UMP Late Model Feature by opening up a big lead at the start of the race. Again, a late caution would change the outlook of the race with Rich Ruff, Brett Miller and Tim Line closed up right behind Jessen for the restart with just two laps to go. Ruff jumped to the outside of Jessen and didn’t hold anything back sending sparks flying as he scraped the front stretch wall while side by side with Jessen as the duo took the white flag. Ruff finally cleared Jessen as they entered turn three and led Jessen back to the finish line. Ruff made it a clean sweep on the night, earning his first Oakshade UMP Sportsman Heat win and Feature win. Jessen finished a close second followed by point leader Brett Miller and Tim Line. Brian Fisher finished fifth. Jim Scout managed to start on the pole and lead his entire feature race all the way to the checkered flag in the UMP Bomber A Main, but once again, Don Williams Excavating Night produced another exciting finish with three drivers battling for the win in the final lap. Dean Taylor and Billy Brown got together exiting turn four turning Brown sideways to bring out a yellow flag with just three laps to go. Craig Dippman has been extremely strong the past month and a half, winning four of the last five UMP Bomber A Mains at Oakshade and he, along with Garry Domoe both took a shot to the inside of Jim Scout on the final lap. Scout was able to hang on to come away with his third A Main win of the year and add a little cushion to his point lead in the UMP Bomber division. Craig Dippman edged out Garry Domoe for second. Jake Gamber finished fourth and Tim Mullendore came home fifth after starting tenth. Josh Froelich led the first three laps of the UMP Hornet Feature until a Derek Morris spin brought out the caution flag. Dylan Herman took advantage and snatched the lead away on the ensuing restart. The fifteen-year-old driver went on to win his sixth feature of the year followed by Oakshade’s UMP Hornet point leader Drew Smith. Froelich slipped back to finish third followed by Derek Morris, who worked his way back up to fourth after his early caution, and Dylan Burt. Wauseon, Ohio’s Matt Lane led from flag to flag in the UMP Bomber B Main en route to his second B Main win of the year. Dan Plath finished second with Kyle Light third. Joe Cordes and Bob Krumm rounded out the rest of the top five finishers. Tim Fisher was challenging Nathan Goodman for the early lead in the UMP Bomber C Main before retiring to the pits after one lap. Goodman then created his own problems on lap four when he gave up the lead after spinning in turn two. Brad Brehm inherited the lead and went on to post his first feature win over James Kepling, Michael Goodman, Mike Treece and Jesse Bergan. See who will be crowned champion as four drivers are still in the hunt entering the final night of Oakshade Raceway UMP Late Model points racing which should make for an entertaining UMP Late Model Season Championship Night coming up on Saturday, August 29. UMP Sportsmen, UMP Bombers and UMP Hornets will also be back in action with gates opening at 4pm and racing at 7pm. Ada, Ohio’s Jon Henry has finally found his groove at Oakshade Raceway, winning his third consecutive UMP Late Model Feature at the 3/8 mile oval on Saturday night. At the same time, Tyler Boggs closed up the UMP Late Model point battle moving to within 58 points behind Rusty Schlenk with only two weeks left in their season. Tyler Boggs and Eric Spangler started on the front row and battled hard for the lead on the first lap, but Jon Henry snuck by both drivers to take the lead before the completion of lap one. Henry went on to open up a large lead over Boggs. Boggs found himself trying to fight off a hard-charging Casey Noonan for second place by lap 10. Noonan finally passed Boggs on lap 14 and began to close in on Henry. Noonan could only get to with a few car lengths of Henry and then began to fade a bit toward the end of the race allowing Jon Henry to capture his fourth UMP Late Model Feature victory of the year. Tyler Boggs was able to edge out Noonan by just a few inches for second at the checkered flag. Ronnie Perrine Jr. and Kevin Reeve both moved up after starting deep in the field to finish fourth and fifth respectively. Scot Mills tried to fend off Joe Smith early in the UMP Sportsman Feature with Smith eventually taking command. Scot then fell back through the running order. Brian Fisher and Brad Mills were battling side by side for second when Mills suddenly fell off the pace as the field scrambled around his ailing car. Mills limped back to the pits as the race continued under green. Scot Mills then lost a drive shaft on the front stretch that did bring out the caution on lap 16. Joe Smith went on to pick up his third UMP Sportsman Feature win of the year over Amy Bernard who got by Brian Fisher to post a strong second place finish after starting seventh. Rich Ruff and Mike Jessen rounded out the rest of the top five finishers. Matt Lane lost a wheel on the first lap of the UMP Bomber A Main bringing out the yellow flag and resulting in a complete restart. Craig Dippman started on the pole and led the entire distance on his way to his fifth feature win of the year. Point leader Jim Scout retired to the pits early in the race allowing Danny Hogrefe to close to 26 points behind him in the standings. Craig Dippman’s win moved him to within 100 points of Scout as he sits fourth in Oakshade Bomber points. Joe Overmyer finished second followed by Billy Brown and Dan Shaffer. Todd Silvey started 15th and finished fifth. Things got exciting at the start of the UMP Hornet Feature as Derek Morris got turned hard into the front stretch wall. The rest of the field did a great job avoiding Morris as he spun down the straightaway. Oakshade UMP Hornet point leader Drew Smith got the early lead and held on to finally picked up his very first feature win. Cody Stetten finished second followed by Dylan Gensler, Tyler Line and Dylan Burt. Jim Guinn grabbed the early lead of the UMP Bomber B Main, but Doug Miller gave him a run for his money after getting under Guinn for the lead late in the race. A caution for debris set up a two-lap shootout to the finish that featured Miller and Guinn battling hard with Guinn reassuming the lead at the end to pick up his second B Main win of the year. Miller had to settle for second followed by Dan Dippman in a borrowed ride, Rick Dixon and Chris Williams. Jeremiah Floyd led from flag to flag in the UMP Bomber C Main. A spin by Josh Overmyer while he was running third added a little excitement as the field scattered to avoid him. The red flag flew on lap three as fire erupted under the hood of Chris Osborn’s machine. Marty Bloomer was closing on Floyd near the finish, but ran out of laps to catch him as Floyd took the checkered flag. Bloomer settled for second. Michael Goodman was third followed by Justin Gamber and Robert Meinen. Saturday, August 22 is Don William’s Excavating Night featuring a full program of UMP Late Models, UMP Sportsman, UMP Bombers and UMP Hornets. Gate open at 4pm with racing at 7pm. Oakshade Raceway hosted its third American Late Model Series (ALMS) event of the year on Saturday night with $2,000 on the line for the feature winner. John Henry came into the night with a slim ALMS point lead over Brian Ruhlman and suffered engine trouble during hot laps. 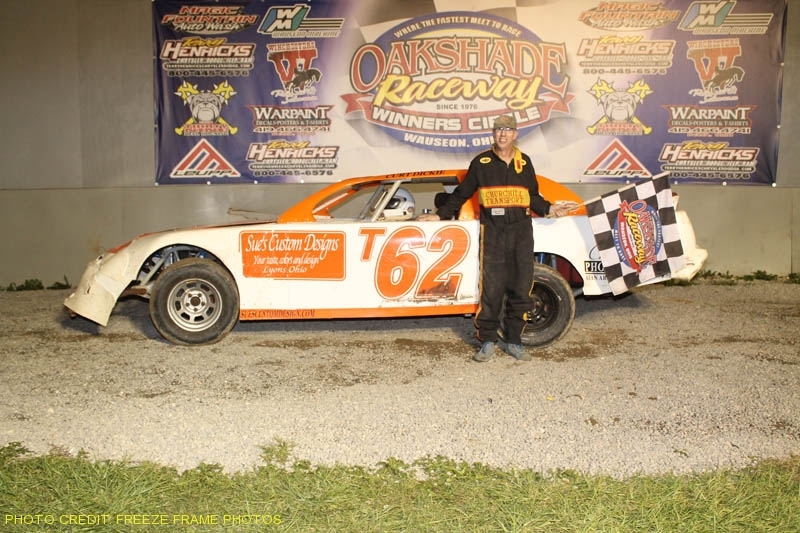 Luckily Henry was able to borrow a ride from Brian Koebbe and Henry wheeled that car to earn his third Oakshade Raceway feature win of the year. Tyler Boggs started on the pole and led the first 14 laps of the 30-lap ALMS Feature event. Henry claimed the top spot on lap 15 leaving Boggs to battle with Rusty Schlenk for second. Schlenk eventually got by Boggs and then started to challenge Henry for the lead using the outside groove. Henry took notice and switched up his line to match that of Schlenk and began to once again open up his lead. Rich Neiser then closed in on Schlenk to battle for second and the two drivers tangled entering turn one sending both cars spinning to bring out the caution flag. Both drivers were sent to the tail for the restart with just four laps to go. John Henry held off Boggs to pick up the victory and add to his ALMS point lead. Boggs held on to finish second. Dan Wallace and Casey Noonan finished third and fourth respectively after starting deep in the field. Wallace started 14th and Noonan 13th. Rick Delong finished fifth. Brian Fisher led the first couple laps of the UMP Sportsman Feature event, but Mike Jessen quickly marched his way to the front and took command on lap three. Mike Jessen, the defending Oakshade Raceway Sportsman track champion, was the class of the field as he went on uncontested to win his second feature of the year. Sportsman rookie Brett Miller finished second followed by Brice Luttrell and Joe Smith. Brian Fisher slipped back to finish fifth. Oakshade UMP Bomber point leader Jim Scout started on the pole of the UMP Bomber A Main and quickly slipped back through the field. Danny Hogrefe assumed the lead at the start. Craig Dippman began to pressure Hogrefe for the lead and appeared to have it until a caution for a wreck involving Bob Mayer, Curt Lancaster, Dan Bleikamp, and Terry Rushlow reset the field to the order of the previous lap. After the restart, Hogrefe, Dippman and Ron Tolles raced three-wide for the lead with Dippman eventually taking it. Dan Plath worked his way up to third, but suffered a flat tire on lap 11 and spun. Dippman went on to win his fourth A Main of the year with Todd Silvey getting by Hogrefe to finish second. Ron Tolles was fourth and Billy Brown finished fifth. Adam Noonan jumped out to the early lead in the UMP Hornet Feature after starting on the pole. Derek Morris began pressuring Noonan for the lead early and finally squeezed underneath Noonan for the lead on lap six. Fourteen-year-old Derek Morris went on to post his second feature win of the year with Noonan a close second. Drew Smith finished third followed by Dylan Herman and Dylan Gensler. Tim Mullendore had a good run early in the UMP Bomber B Main, leading the first eight laps of the 12 lap event. A pile up on the backstretch that involved Karl Spoores, Micheal Goodman, Chuck Faller, Jeff Geis and Matt Lane slowed things down on lap two. Dan Dippman quietly worked his way toward the front and took the lead from Mullendore on lap nine. He would go on to earn his fifth B Main win of the year. Rick Dixon finished second as Mullendore held on to finish third. Roscoe Stetten started 18th and worked his way up to finish fourth with Bob Krumm fifth. Jake Gamber dominated the UMP Bomber C Main, getting the lead on the first lap after starting sixth. Gamber proceeded to check out on the rest of the field and went on to take the checkered flag. Mike Miller took second followed by Chris Tressler, Marty Bloomer and Justin Woodruff. A full program on racing is on tap for Saturday, August 8 with UMP Late Models, UMP Sportsmen, UMP Bombers and UMP Hornets. Gates open at 4pm with racing at 7pm.